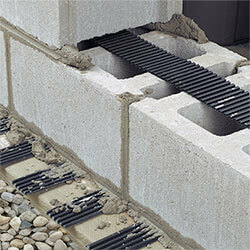 A dry basement begins with a building site that can be managed to control moisture. A soils report should also be obtained. Once the project is started, jobsite moisture management is critical. Surface water should not be allowed to run toward the foundation, and the below-grade construction should be completed as quickly as possible. Floor Edging and Control Cavity feature MTI’s slipsheet technology. Together, they form and separate concrete from other construction details and restrict temperature and moisture transfer keeping moisture that forms on walls via condensation or moisture that’s forced through walls by pressure to move down the wall and between the wall and the floor and into the drain field drain tile system. This moisture is then transferred to the sealed sump basket sump pump system and transferred out of the below grade (basement) living space. 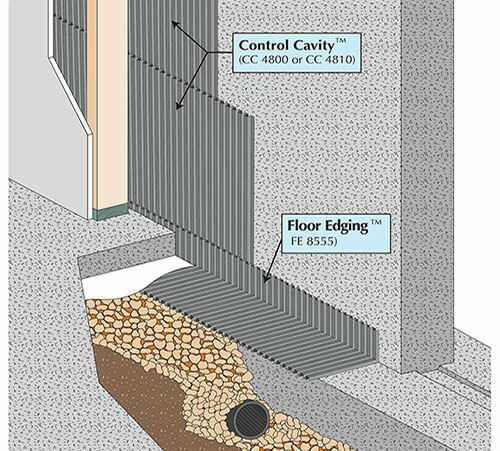 MTI’s Floor Edging, Control Cavity and our sump basket products have been successfully used in thousands of homes and commercial buildings to resolve the toughest moisture challenges. Floor Edging and Control Cavity are made from 100% Post Industrial Recycled Material. Vent MatTM - used on top of the footings to weep the cores of blocks and direct the moisture out of the wall and into the drain field drain tile system behind the Floor Edging. Vent Mat works because it features MTI's tunnel weep technology and is at the lowest point of the wall, where the water is. Mortar BeltTM - prevents trash mortar buildup in block walls and keeps the weeps at the bottom open so moisture that is forced into block walls can exit quickly. Vent Mat and Mortar Belt are made from 100% Post Industrial Recycled Material.